Saudi Al-Dossari wins the first edition of the Middle-East rally raid driving a Nissan Navara with DakarCorse wheels. Saudi Arabian driver Essa Al-Dossari and Emirati navigator Ali Hassan Obaid were the winners of the inaugual Jordan Baja and cruised through the final day in the magnificent desert surroundings of Wadi Rum to secure victory with a margin of over 45 minutes. 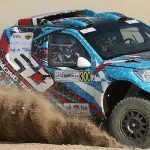 Saudi rivals Fares Al-Moshana and Motab Al-Shammeri confirmed an all-Nissan and and all-Saudi podium with second and third places in their Patrols. Khalid Al-Hamzani was fourth and Ahmad Al-Malki broke the Nissan strangehold on the leading positions with fifth overall in an Isuzu D-Max. The Deaf Rally Team Saudi Arabia’s Fahad Al-Abdallatif confirmed victory in the T2 category, finishing sixth overall. Hand signals were used by navigator Ziyad Al-Harbi to achieve an excellent result for the determined driver. 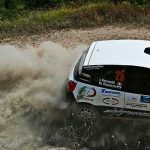 After the race in Jordan, the spotlight moves to Morocco for the Rallye du Maroc, the tenth round of the FIA World Cup for Cross-Country Rallies, scheduled from 3 to 9 October.